Mountain Dew is one of the most popular modern drinks in the western world, and fans of the drink have developed an almost cult-like affection towards it. If you knew these facts, you will never drink Mountain Dew again. The serious issue concerning this drink is the fact that it is so regularly consumed and people are not aware of what it contains and the adverse effects it is having on their health. This article aims to share some important facts about the consumption of this drink and the dangers it can cause to your health. The last we checked on Mountain Dew website, they have rebranded the drink to simply “Mtn Dew”. To answer this question, let’s take a look a closer look at the ingredients in this drink. Let’s hear it from the horse’s mouth. This list was last updated on March 18, 2019, as stated on the label in the screenshot below. What Does Mountain Dew Do To Your Body? As we take a closer look at the ingredients in Mtn Dew, you can understand the danger of each of them being present in a drink that is ingested into your body. So, imagine ALL of these ingredients put together, then you can imagine the tremendous harm it can cause to your health. Carbonated water in beverages is water that has been artificially injected with carbon dioxide gas under pressure. Carbonation causes small bubbles to form, giving the water an effervescent quality. What does carbonated water do to your body? Carbonation gives the drink a slightly tart flavor, and it now requires your kidneys and lungs to put in that extra work of having to remove the excess carbon dioxide from the drink. Every process such as this will use up some nutrients in your body. If your diet consists of mostly processed foods, and not enough fresh foods, you can quickly become deficient. What is the pH level of Mountain Dew drinks? The chemical reaction of carbon dioxide and water produce a weak acid with a pH level of 3-4. 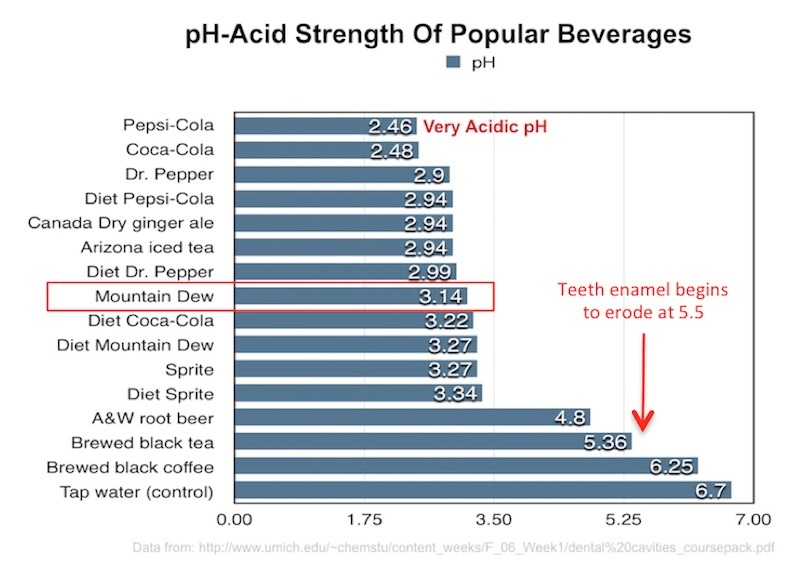 According to a report by the American Dental Association (ADA), the pH value of Mountain Dew (regular) is at 3.22; Mountain Code Red at 3.26, Mountain Dew Diet at 3.18, and Mountain Dew Voltage at 3.05. In the same report, it confirms that the consumption of acidic beverages contributes to an erosive oral milieu. It is also mentioned that pH is the critical determinate of a beverage’s erosive potential. A study has linked consumption of carbonated beverage with diabetes, hypertension and kidney stones, all risk factors for chronic kidney disease. Considering that Mountain Dew drink is also very high in sugar (46g per serving size of 12 fl oz), the chances of these chronic diseases occurring is very high. 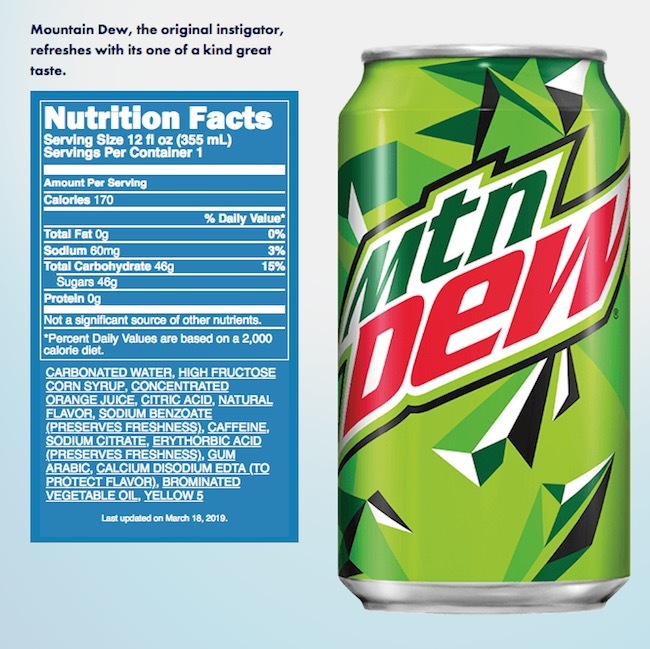 In the Mtn Dew ingredients label as above, you can see High Fructose Corn Syrup (HFCS) being one of the main ingredients. If you see this ingredient on any label, you can be sure that the food is pure, processed junk. Responsible food manufacturers wouldn’t put this in food, and smart consumers shouldn’t consume these foods. What does HFCS do to your body? HFCS is the typical added sugar component of many processed foods and have potentially negative health consequences. Most of the high fructose content that enters into your liver and cannot be converted into fat, will ultimately end up messing your body’s metabolism works. The results will be insulin resistance, obesity, type 2 diabetes and high blood pressure. Besides the huge load of fructose and sugar found in HCFS, it has also been found to contain other harmful chemicals, contaminants and even trace amounts of mercury! HFCS is an industrial food product that is far from “natural”. It is not a naturally-occurring substance. Consumption of HFCS goes right to the liver and triggers lipogenesis (the production of fats like triglycerides and cholesterol)—liver damage and causes fatty liver. High doses of HFCS literally punch holes in the intestinal lining, causing leaky gut that allows harmful byproducts of toxins, partially digested food proteins and gut bacteria to enter your blood stream, causing inflammation that is root cause of many chronic diseases. “Concentrated orange juice” sounds good, simply because of the words “orange juice”—it’s natural, isn’t it? According to the Dictionary of Food Science and Technology: A juice concentrate has most of its water removed through filtration, extraction and evaporation processes. Evaporation involves heating the juice to high temperatures, and extraction involves adding some chemicals to get a more condensed product. This process significantly lessen the nutritional value of the fruit. The juice is then also pasteurized as part of the process to extend its shelf life. Even 100% fruit juice from concentrate can contain additives to enhance its color and flavor. Foods that contain naturally occurring citric acid (for example from citrus fruits) are beneficial and totally harmless for consumption. Citric acid is an antioxidant that protects your body from damaging free radicals. However, in the food industry, extracting citric acid from whole fruits is too expensive. As an alternative, artificial citric acid is made from feeding sugars to the fungus Aspergillus niger (a common black mold). When the black mold is filtered out for extraction of the artificial citric acid, it is believed that the microscopic waste products left behind by the fungus (mycotoxins) are not entirely eliminated. Experts are concerned that ingesting these mycotoxins regularly may cause respiratory issues, allergies and even chronic illnesses. Conventional medicine uses Caffeine and Sodium Benzoate injection to treat respiratory depression associated with overdosage of anti-depressant drugs. What are the side effects of caffeine sodium benzoate? Headache, excitement, agitation, restlessness, irritability, anxiety, hyperventilation, shortness of breath, visual disturbances, nerve sensitivity, tingling in the hands and feet, ringing or buzzing in the ears, hearing loss, trouble sleeping, muscle tremors or twitches, increased urination, rapid heart rate and other cardiac arrhythmias. How does caffeine affect your health? Caffeine is not only found in coffee, but also found in most energy and soft drinks. Caffeine is a natural stimulant that acts by activating the central nervous system to fight tiredness, improve concentration and focus. Although the effects of caffeine can vary from person to person, individuals with anxiety disorders, children and adolescents are more susceptible to the negative effects of the compound. What are the negative effects of caffeine consumption? As each individual’s threshold for caffeine may differ, it is difficult to say how much caffeine consumption can cause negative effects. Even moderate amounts of caffeine may cause negative health effects to individuals who are susceptible. Some of the negative effects reported of caffeine consumption include: Insomnia, nervousness, restlessness, irritability, upset stomach, heart palpitations and muscle tremors. According to Caffeineinformer.com, there is 54.8mg caffeine in the regular Mountain Dew, 55.2mg in Diet Mountain Dew, and 55.4mg in Diet Mountain Dew Code Red. Brominated vegetable oil is a synthetic compound derived from corn or soy, bonded with the element bromine. It is added to some soft drinks as an emulsifier. Bromine is heavy and it keeps the fruit oil (in this case, the orange concentrate) from floating to the top of water-based solutions. Drinks that contain BVO usually look hazy or cloudy. Why is brominated vegetable oil dangerous? Brominated vegetable oil was initially created and used as a flame retardant (or antifreeze). For that purpose, it is not dangerous. However, when it’s added in food or beverage and being consumed internally is when it becomes dangerous to your health. Bromines are common endocrine disruptors that prevent your body’s absorption of iodine. Studies suggest that this synthetic compound does not get assimilated in our body and can accumulate in human tissues, causing toxic effects when consumed in large doses. Why is brominated vegetable oil bad for you? Some health problems that may manifest from bromine toxicity include psychotic symptoms, disrupts normal hormone function, reproductive problems, skin rashes, severe acne, loss of appetite, abdominal pain, loss of muscle coordination, and in more severe cases, cardiac arrhythmias (abnormal heartbeat rate), even memory loss. Is BVO still in Mountain Dew? The last we checked on their site, Mtn Dew still contains brominated vegetable oil (BVO). Please see the ingredients list above. Where is brominated vegetable oil banned? BVO is banned as a food additive in Japan, India and the European Union. Although FDA USA has originally categorized BVO as “generally safe”, the agency later reversed that decision. Currently, on an interim basis pending more research, the FDA allows BVO to be used as a food additive. Yellow 5 is also known as Tartrazine or E102. It is a synthetic lemon yellow dye, manufactured from coal tar, commonly used as a food coloring. Yuck! A report by Center for Science in the Public Interest (CSPI) states that among the few widely used dyes, Yellow 5 is contaminated with known carcinogens (cancer-causing agents). These synthetic chemicals do absolutely nothing to improve nutritional quality or safety of foods, but trigger behavioral problems in children, and possibly cancer in anybody. Mountain Dew has a very high sugar content that adds on to its acidity and toxicity. 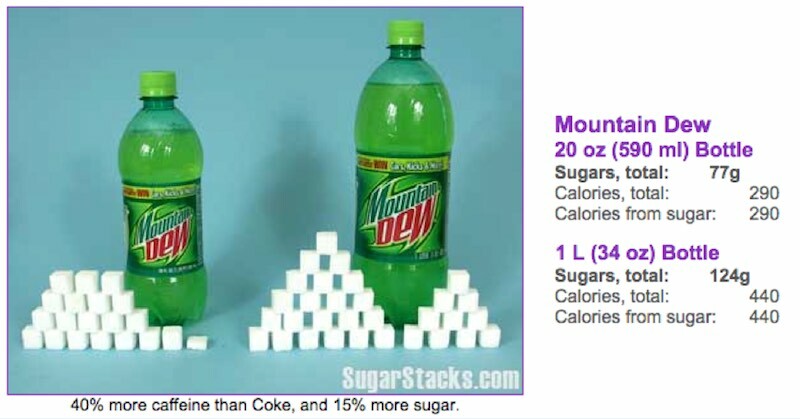 Here’s a chart to show you how much sugar is in this beverage. A study out of Maquarie University showed that sugar and caffeine when combined and fed to rats produced lasting changes to brain chemistry. This could allude to how sugary sodas and energy drinks could possibly affect human brains. Researchers from the University of California in San Francisco found that those who drink just 20 fl oz of sugary soda a day may take as much as 4 years off of their lifespan. Not only do soft drinks contribute to disease, but they also shorten telomeres, which are the areas on our genes responsible for aging. How much sugar is in Mountain Dew? 46 grams of sugar / 12-oz can = 11.5 teaspoons! 77 grams of sugar / 20-oz bottle = 19.25 teaspoons! 124 grams of sugar / 34-oz (1L) bottle = 31 teaspoons! Find out here, what kind of damage this amount of sugar can do to your body. Is Mountain Dew bad for males? Can Mountain Dew lower sperm count? These are valid questions. The short answer is “probably”. As we shared above, bromines are endocrine disruptors that can disrupt your normal hormone function and cause reproductive or fertility problems in both males and females. As many of the ingredients listed above that are found in Mountain Dew, are synthetic (manmade) they can accumulate in your body’s tissues when consumed in large amounts over a period of time. These contribute to poor immunity, especially when coupled with a poor diet that is high in processed foods. In 2009, Ronald Ball discovered something jelly-like in his Mountain Dew drink that he had purchased from a vending machine at his work. When he poured out the contents of the can, the remnants of a tiny mouse came out along with the jelly-like substance. After Ball contacted Pepsi and told them about the situation, they sent a representative to retrieve the mouse remnants from Ball. According to reports, Pepsico later responded by stating that the mouse would have long dissolved before Ball would have had the chance to open the can of Mountain Dew. It is difficult to tell which part of this story is more disturbing. Is it the fact that a man claims that he had found a mouse in his can of Mountain Dew, or the fact that Pepsico has publicly claimed that Mountain Dew has the ingredients necessary to fully dissolve an entire mouse? Either way, it would probably be a good idea to just avoid Mountain Dew altogether so you don’t have to find out. Yikes!